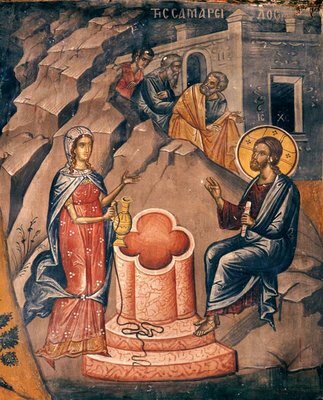 5th Sunday of Pascha – The Samaritan Woman. Literacy, thirst, humility. zeal. 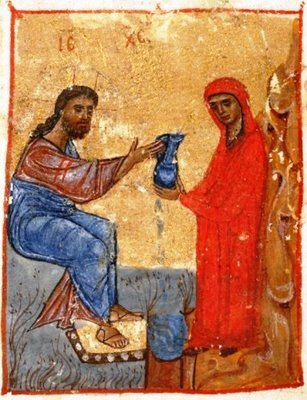 Brothers and sisters, this story about the conversion of the Samaritan Woman is also in line with all of the Gospels of this Paschal period about enlightenment. We can speak of many things concerning it. Since it is a historical event, there are practical things that happened that we can glean from the way the Lord talked to her and the reactions of this woman who has a name, Photini, Svetlana, Equal to the Apostles. And also, it has a wealth of theology in it, and also, a lot of mystical theology in it as well. And, as it should be all Scripture for us, there should be a practical application, something that touches us. My meaning might be different than yours. I’m speaking of where certain things touch us in a certain way. That’s the way the Scriptures should be for all of us. Now, this only happens if you read the Scripture often. If you don’t read the Scripture very often, then it’s not going to touch you very often because it’s complicated. This story is extremely complicated. The theology spoken of here is very complex. So if we only read the Scripture occasionally, then the full nuance of the story will not reach our hearts. This woman was theologically literate. Oh, she was incorrect in her theology because she was a Samaritan. The Samaritans only accepted the five books, the Pentateuch of Moses. They had little to say about the prophets, didn’t like them very much, and they had mixed in some pagan practices. So the Jews hated them. So her theology was not all correct, but she was theologically literate, as you can see from the story, when she asked the Lord intelligent questions based upon her theological world view. I think we can learn many things from the story, but the most important one, the essence of the story is: how can we obtain the Living Water? Because the focus of the story is our obtaining Living Water, which the Lord offers to her, and of course Living Water is the Holy Spirit. How does one obtain it? The actions of Saint Photini show us how you obtain the Living Water, and her actions were very nuanced, very beautiful. Let’s go over her personality because her personality must be inculcated in our personality. Her errors are probably a lot like our errors. But are our virtues like her virtues? She was theologically literate. She knew the Scriptures. She could ask intelligent questions. So when the Lord had a theological discussion with her, she understood. And as her understanding increased, as the Lord gently brought her along, she had the vocabulary, the background, so that she could understand what He was saying and not merely just be offended when He said, ‘salvation is from the Jews.’ She wasn’t a Jew, but she can understand why He would be saying that. And with the grace of God present, her mind was changed. But if she didn’t have a mind to change, she wouldn’t be changed. If she didn’t have some understanding already, then this conversation would have not meant anything to her. So we must have theological understanding, brothers and sisters. I tell you, this is a difficult Scripture for a pastor to preach about because it’s very complex, very nuanced. There are many roads to go down, and some of them would be unintelligible to most of you and not profitable to you because you don’t read the Scripture enough, because you don’t come to the Services and hear the Scriptures expounded enough. Last night we covered it. These Scriptures were covered. The Samaritan Woman, the Living Water, was covered over and over again in the vigil service. This is the kind of thing you need. You might not think you need it. You might not feel the loss, but you are poorer if you do not have theological understanding. The Lord said it Himself, and He said it in many other places, but today He said it: You must worship God in spirit and in truth. There must be a truth but then you must inculcate it into your spirit. If you don’t know who God is, then you can’t follow Him. It’s important to know that God is Trinity, that Jesus Christ is God and man, that He was born of a Virgin, that He is perfectly God and perfectly man, having two natures that are not mixed together but exist cooperatively in the same person. And having two natures, He has two wills. And His human will, He completely, of His own, subjugated to the Divine will. These things are important to know because they apply to us. If they are just static pieces of information that are a little hard to understand, then you’re not reading enough, you’re not praying enough, you’re not struggling enough. So even if you don’t have a perfect understanding, you can become perfected. God will work with what you know. If you don’t know anything, there’s not much to work with. So I’ll tell you, many of you are very much poorer because you didn’t hear the beautiful theology last night that told us so many truths, restated over and over in poetic ways, about the Resurrection, about the Living Water, about the Samaritan Woman. So, brothers and sisters, there is no substitute for being theologically literate. Christianity is not for people who are not intelligent. I’m not speaking about whether you know reading, writing and arithmetic. I’m not talking about that kind of intelligence. I’m speaking about spiritual intelligence. What should be important to you is to know the things of God. It was important to her. She didn’t know all the truth, but what she did know she knew well. And so when God presented the truth to her, she could understand it. So go home, take a look at your Bible. Does it have any dust on it? It shouldn’t. Consider what your priorities are. Do you pray? Do you fast? Yes, fasting is part of learning theology, too. What are your priorities? What’s the most important thing for you today and tomorrow and the next day? Well, it should be to learn about the One Who is meek and lowly of heart, to take His yoke upon us. That should be the most important thing. He’s not a stranger. There’s much that we can know about Jesus. He spoke of it Himself. The prophets spoke about Him, and the fathers after them. It’s all out there for us to know. And I tell you, there’s a principle, a human principle, that you must hear something many times to understand it. It’s very easy to learn one plus one equals two. That’s a simple fact. But to learn that God became man, you cannot speak of it enough, because the only way to really understand it is to live it. That means reading about it. That means praying about it, listening to the hymns about it, reading the Psalter, because every page of the Psalter speaks about Christ. Every page of the Old Testament speaks about Christ. And all this reading and praying and fasting and struggle must help you inculcate the Incarnation in the way you live. This woman had a good foundation. When the Lord revealed to her the truth, she could understand it. And we could see practical things about her personality that we must also possess. She was a good woman living in a bad situation. She was living with a man. She had had five husbands before. I guess the saying is, there was a lot of mileage on her. Definitely hadn’t had a perfect life. She was going to the well late in the day when it’s hot. Everybody else would go in the morning. She went at noon. Why? Because she didn’t want to be around other people because of her shame. Here’s one of those personal applications of Scripture. Perhaps this doesn’t mean as much to you as to me, that’s okay. Hopefully there’s something else in the story that really touches you, really makes you want to change or maybe gives you hope that you will change, and have confidence that you will change. The woman went to the well at noon because of her shame. The Lord spoke to her about Living Water that cleanses away all shame. And then – miracle of miracles – her heart was so changed that she didn’t care about her shame, and she went to her own people and became equal to the apostles and told them of the Messiah. A conversation of what? An hour or two, maybe? – completely changed her. He life became completely different; There was no longer any shame but now hope, now joy, now understanding. That’s what the Lord can do for each one of us. What a wonderful thing it is to have our shame taken away by the Living Water. But it’s not going to happen unless we’re like her. And we have already spoken of her theological understanding. And if you don’t have it, you’d better get it, and you’re not going to get it by sitting at home, and you’re not going to get it by being wherever you are on Saturday night instead of the vigil. You’re not going to get it unless you read and pray and study. Look at her personality. She’s a woman of deep zeal, of interest in the theological things. When the Lord started to speak to her, she was interested. Can you see her in your mind’s eye sitting up and listening carefully, watching the Lord, eyes fixed on His, thinking that this is a holy moment? She didn’t know who He was yet. He was just a Jew who was lax, in her opinion, according to Saint John, because He was asking for water; the Jews shouldn’t even use the vessels of people that are considered unclean. But she was listening to Him with desire because she had thirst. I tell you, the Lord offers Living Water to all of us, to the entire world, and a lot of people are not thirsty. If you’re not thirsty, you’re not going to want the Living Water. Now, everyone should be thirsty, but not everyone is. And even among Christians, there are different levels of thirst. If you desire with all your heart to be holy, God will help you to be holy. Most people don’t desire that. That’s why we live in such mediocre ways. But this woman was thirsty. So when He offered her water, although it was something that sounded impossible because she was thinking of water; you drink water and later on you have to drink more. But He said you don’t have to drink anymore. You would never thirst again. It didn’t make any sense to her. But because of her desire, she continued to question Him and found out about this Living Water, that He was speaking of the Holy Spirit. So we must have the desire. And I tell you, if you don’t have desire, you can gain desire if you want to have desire. More than once I have prayed and I have heard others ask, Lord, help me to have the desire to desire; help me to want to change. Perhaps it is sometimes with a person that we have some trouble with and we want to forgive them, but there’s something in our heart that doesn’t let us. Of course it’s our sins; it’s our darkness. But the desire to forgive them is the beginning of forgiveness. So she had desire. And so should we. And desire just doesn’t fall out of Heaven like manna. Desire comes to you from your effort. If you’re cold, then do something to become warm. Saint John Climacos has this proverb that he says in The Ladder. He says, some people, when they begin to exercise, they do it slowly and their joints hurt, but after a little while of movement the joints warm up and they go faster. And he says, heed this proverbial word. What it means is: if you’re cold, do something to become warm. So you don’t love God, do something to love God. Pray, fast, come to the Services, read the Scriptures, even if they seem unintelligible to you. Struggle to be kind to the person that you don’t want to be kind to. Make small little steps, and eventually you’ll complete the whole journey. Now, how did she react to this? I think what happened in her heart was there was this little glimmer of warmth thinking: ‘Maybe I can finally be delivered from my shame; maybe I can be rid of this sort of up and down in my life and stop coming to the well at noon because of my shame; maybe I can change; if this man knows this about me, maybe he can help me in some way.’ She didn’t know he was God so from her perspective, she said “I perceive you are a prophet.” She was correct, He is a prophet. Can you feel in her heart this little desire, this little feeling that “I can be changed?” You should feel that every day, you know, just like she did. Every day you should think: God can change me. The things that I am now I won’t be later. The things that I am not now I will be. The things that I cannot do, God will help me to do. The darkness that is in me will become light. Not today maybe but certainly tomorrow. She had the feeling in her heart. This was holy, divine moment because this was a time in which she could be either offended with the Lord and go her way, thinking He’s just like everybody else, judging me. Or she could look into His eyes and see that He held the key to life. people and tell them: This is the Messiah, we’ve found Him. So we’ve got to be like her too, share the Messiah with others. But you can’t share what you don’t have, brothers and sisters. If you don’t have that hope in your heart to become better, you can’t share it with others. You’ve got to feel it in your heart. I tell you, look in your heart. If you don’t feel it, don’t despair, but do something about feeling it. There’s practical things you can do, I’ve told you, to pray, come to church even when it’s boring, even when you don’t feel like it, fast when you don’t feel like it. But it’s more profound than all of that. Those are just the sort of the external things. I mean they are internal too, they should be internalized. But you must have desire to be different than you are today. You must not be satisfied with who you are. I told you many times that I absolutely, this is truth, I want each one of you to feel the darkness in you, to feel that cold that’s in you. Because it’s there. You’re human. Therefore, it’s there. God came so that you’d become all light, and you’re not all light yet. God came so that you would be perfectly warm, but you’re not all warm yet. You know that. It’s the truth. You’ve got to feel it. This woman felt it. And that’s why she was listening to Him, because she felt how dark she was. When the Lord gave her light, she had enough background to understand what He was saying and the nobility of soul to accept it. That’s how we’ve got to be. So this story, I’ve told you before, is the conversation of the Lord with the soul, and it is the Lord speaking to your soul every day. When the Lord reveals to you – and He does this all the time, that He knows you, and that He has a plan for you, that He wishes you to know Him intimately, and that despite whatever is in you, it can be fixed, there should be in your heart what happened to the Samaritan Woman’s heart, this feeling of I can be changed. And then go out and get this change. It’s not just going to happen to you. It’s going to happen because of desire and because of following through on who the Lord is, worshipping the Lord in spirit and in truth. So brothers and sisters, the Samaritan woman, Saint Photini, is a luminous example of how to listen to God. It’s a whole process. It’s a whole life process. I beg of you, look within your heart and see the darkness and feel the cold, because if you don’t feel the cold and see the darkness, you won’t want to change it. You won’t know it’s there. And then do something about this cold and this darkness. Read, study, pray, fast. Order your life so that you would know the one thing that is needful. And that is: How to obtain this Living Water. May God help you. Amen. 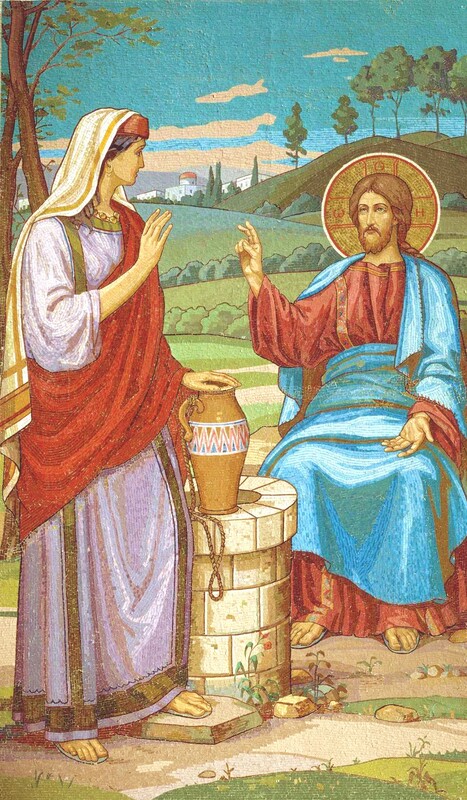 The Samaritan woman teaches us what we MUST do to receive the Living Water. Audio Homily 2010. 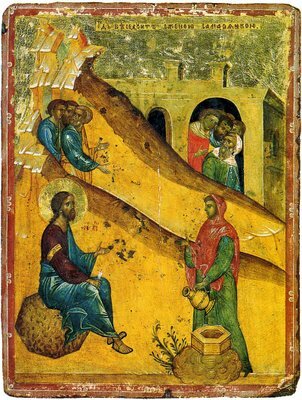 You are currently browsing the archives for the 5th Sunday of Pascha – Samaritan Woman category.